AVENGERS BOOSTER BRICKS - PAVING THE WAY!!! From left to right: Michael Podraza, EGHS Principal; Julie Eckles, President of The Avengers Booster Club; Lori Shipley, The Avengers Booster Club Fundraising Chair; David Green, School Committee; Michael Issacs, Town Council President; Tim Chace, EGHS Assistant Principal; Chris Cobain, EGHS Athletic Director; Steve Lombardi, Executive Director, East Greenwich Chamber of Commerce. 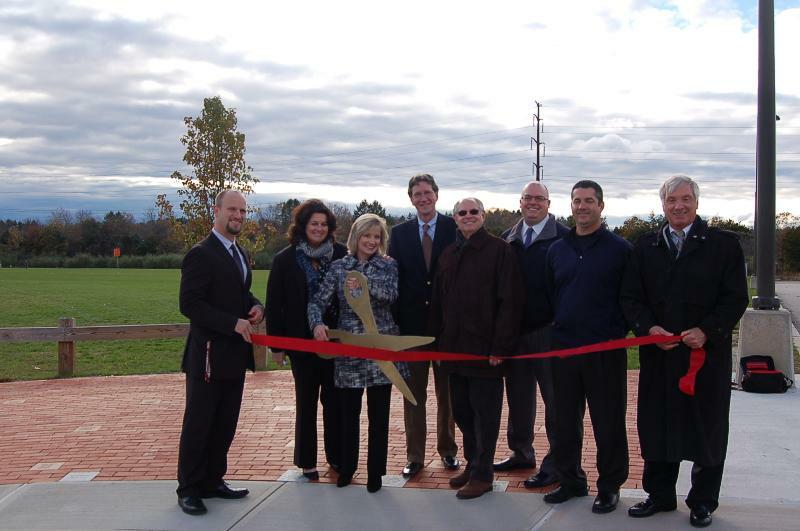 East Greenwich High School's Carcieri Field Complex was the site of the official unveiling of The Avengers Booster Club's Commemorative Brick Walkway on Friday, November 2, 2012. The new walkway, located at the field entrance, is a major fundraising effort of The Avengers Booster Club and showcases inscribed bricks from students, alumni, friends and local businesses. "We have several ways of raising money for our athletes and our brick walkway is just one of the major ways we fund our programs," said Avengers Booster Club President Julie Eckles. "Our fundraising efforts help to supplement the Athletic Department's budget, along with our scholarship program and other activities. We are a pretty active bunch and are always welcoming new members." Lori Shipley, fundraising coordinator for the Avengers Booster Club, was instrumental in bringing the walkway to fruition and continues to spearhead the fundraising campaign. " The brick walkway is a great way to pay tribute to students, coaches, faculty and alumni. Community members and local businesses can show their support by purchasing a brick. It's great advertisement and supports our local athletes." Bricks are available in three different options and are installed two to three times a year. Engraved with names, dates and messages, they make great gifts for holidays or graduation!